Jakarta Terror Attack 14/1/2016 - What do we know? On 14 January 2016, a terror attack took place in the capital of Indonesia, Jakarta. 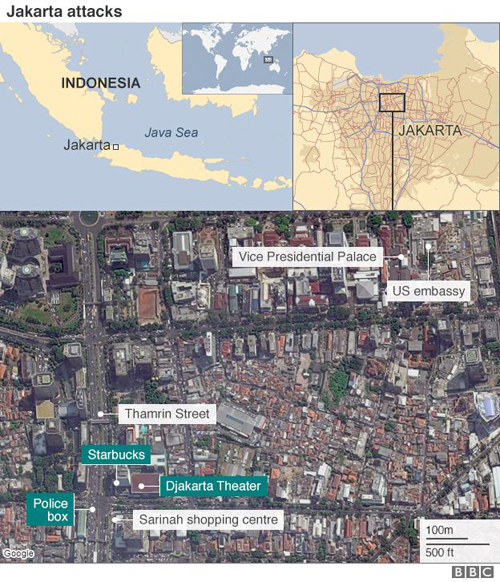 The location of the attack was a major intersection in Jakarta, near the Sarinah shopping mall. The main targets were the Starbucks café and a police post near the intersection. The attack involved a suicide bomb blast at the Starbucks café, gunmen shooting at customers who ran out of the café, a suicide bomb explosion at the police post and a gun battle with the police. This was the first major terrorist attack in Jakarta since 2009. According to Indonesian police, the guns used in the attack are most likely from the Philippines. This information on the origin of the weapons came from some of the 12 people arrested in the raids that were conducted after the attack (more details below). The attackers also used an unknown number of suicide bombs and home-made grenades, but reports say that at least six explosions occurred in quick succession. At 10:40 am, several bombs exploded near the Sarinah shopping mall, at the intersection between Jalan Kyai Haji Wahid Hasyim and Jalan MH Thamrin. The first blast targeted the Starbucks café. As civilians ran out of the café, two gunmen shot at them. The two gunmen seized two civilians, dragged them to a parking lot, and shot them. At approximately the same time, at least two militants attacked the police post in the center of the intersection in a suicide bomb attack. After the police arrived, there was an armed stand-off for several hours between the police and the attackers. The attackers threw grenades and fired rifles at both civilians and the police. The police had to battle the militants for hours on the streets. The stand-off ended at approximately 3:20 pm. An Algerian-Canadian citizen, Taher Amer-Ouali, 70, was shot by the attackers. An Indonesian, Rico Hermawan, 21, was killed in the suicide bomb attack at the police post. An Indonesian, Sugito, 43, died in the attack. Indonesian police initially thought that he was a perpetrator of the attack, but later claimed that he was not (more details below). An Indonesian, Rais Karna, 37, who was a security guard at a nearby bank. All four militants were killed in the attack – two died from suicide bombs and two were shot by police. The police initially reported that there were five attackers, but later corrected their report to note that there were four. The attackers were Afif Sunakim, Marwan a.k.a. Muhammad Ali, Ahmad Muhazan Saron, and Dian Juni Kurniadi. The fifth man, Sugito, was at first thought by the Indonesian police to be one of the perpetrators, rather he was a victim. ISIS took credit for the attack, and claimed that there were four attackers. Afif Sunakim, in his 30s, was from Karawang, West Java. He was sentenced to seven years in jail for attending a training boot camp for militants in Aceh. He was captured by the police in 2010. While in Cipinang prison in Jakarta, his ideology became even more radical after meeting Aman Abdurrahman, a central figure connecting several IS-aligned terrorist organisations in Indonesia. While in jail, he refused to cooperate with a de-radicalisation program. He was released from prison in August/September 2015 on early parole. Marwan a.k.a. Muhammad Ali, 40, was alleged to have been involved in several deadly armed bank robberies in North Sumatra aimed at raising funds for a terrorist training camp in Aceh. He was a father of three who lived in Sanggrahan, west of Jakarta. He was described by his brother as a “very private person”, “disciplined and nationalistic”, and a “good man”. His neighbours described his as a “nice and humble” man who had “wanted to go to Syria to free Muslim people from oppression”. According to his neighbours, he had said that “if someone wanted to give him some money to go to Syria, he would be very happy”. Ahmad Muhazan bin Saron, 25, exploded a suicide bomb in the Starbucks café. Dian Juni Kurniadi, 26, exploded a suicide bomb at the police post. Inspector General Tito Karnavian, Chief of Police, said that the attackers were linked to other cells in Java and Sulawesi. According to security analyst Yohanes Sulaiman, the attackers showed that they were inexperienced; this suggests that the attackers were an amateur group, not foreign fighters trained in Syria. Mr Yohanes’ interpretation is that the attackers are part of a new generation of radicalised militants, who lack equipment and combat experience. The Indonesian police believe that the attack was planned and coordinated by Bahrum Naim, an Indonesian citizen who joined ISIS in Syria. Naim has links with the ISIS-allied East Indonesia Mujahidin Group (MIT), based on the island of Sulawesi. Naim set up Katibah Nusantara, the Southeast Asian militant wing of ISIS, with the vision of uniting all ISIS supporting elements in Southeast Asia. According to police chief Tito Karnavian, Naim wants to be ISIS's leader in the region, which is why he plotted the attack. Naim was arrested in 2010 for illegal possession of ammunition and was sentenced to at least 2½ years in prison. On 16 January, the police announced the arrests of 12 other individuals. 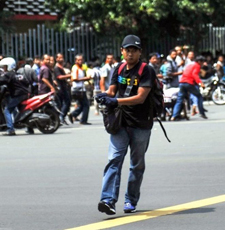 Police spokesman Anton Charliyan said Jakarta attackers and the 12 others who were arrested had plans to attack cities elsewhere in Indonesia, including Bandung, which lies some 120 kilometres south-east of the capital. One was accused of receiving a wire transfer from Naim. The transfer helped to finance Thursday's attack, the police chief said. The Indonesian police have also named an alleged ISIS militant, Abu Jundi, as one of Naim’s coordinators. 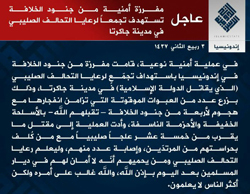 ISIS claimed responsibility for the attack in an official statement – the Arabic and Bahasa Indonesia versions are found below. The English translation of the Bahasa Indonesia version is provided below. There is debate amongst analysts about whether the main target of the attack was the police, civilians or Western targets. According to Benjamin Soloway from Foreign Policy magazine, it is not clear if civilians were the main targets, because the attackers appear to have focused on the police post in the middle of the intersection. According to Judith Jacob, an analyst based in Singapore, extremists in Indonesia have usually targeted the security services. According to Mr. Fitriyan Zamzami, the national affairs editor of Republika, extremists have been targeting the police in previous years, ever since the police started chasing radicals in Poso since 2011 or 2012. According to Mr Zamzami, the police may have sparked the attack by launching a crackdown on domestic terror suspects shortly before Christmas. According to Mr. Ryan Greer, a fellow with the Truman National Security Project, it is significant that the attack happened in a public setting. He sees the home-grown threat starting to overlap with ISIS. According to Ms. Sidney Jones, director of Jakarta-based Institute for Policy Analysis of Conflict, the attack could have been a response to Western-coalition attacks on ISIS in Syria, which have killed many Indonesians. According to the Director of the State Intelligence Agency, Mr. Sutiyoso, the authorities were on high alert for a terror attack to hit Indonesia, five days before the suicide bombings and shootings. The State Intelligence Agency had also told police as early as November that “something would happen". However, it is “very difficult to determine when and where they will strike”, Mr, Sutiyoso said. “We intensified our focus on them, especially during Christmas and the New Year holidays, and sure enough, they struck. Our last piece of information was that they would attack on January 9 but they didn't. They attacked on January 14," he stated. "You can't arrest and detain suspects if they haven't broken the law." On 16 January, Malaysian police announced that they had arrested four individuals with suspected links to ISIS. 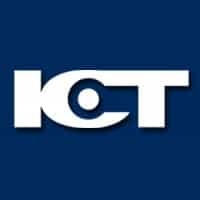 The arrests took place between 11 and 15 January. Police said one of the four men arrested in the past few days admitted to planning an attack in Kuala Lumpur after receiving instructions from an Islamic State member in Syria. Arrested at a train station Friday, police said the 28-year-old man had raised the black Islamic State flag in several locations in Malaysia, in a warning to governments to stop arresting the group’s supporters. The other three suspects were previously arrested by authorities in Turkey after they attempted to enter Syria to join Islamic State forces there. They were sent back to Malaysia on 11 January and were arrested on arrival at Kuala Lumpur International Airport. The main conclusion is that the attackers were most likely not foreign fighters, but home-grown radical Islamists who received instructions from Bahrun Naim, who is the leader of Katibah Nusantara in Syria. At the time of writing this report, it is not yet known if the attackers were members of Indonesian jihadist groups or not. 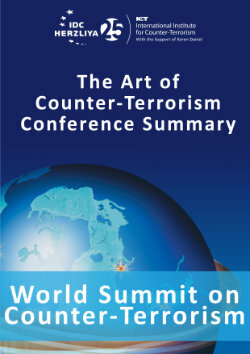 However, since this attack involved the transfer of instructions and funds from an ISIS militant in Syria to attackers in Indonesia, it can be claimed that this attack was the first ISIS attack in Southeast Asia. With the latest arrests in Malaysia, there is growing concern that ISIS is planning more attacks in Southeast Asia. These attacks could be carried out by foreign fighters returning from Syria and Iraq, or by home-grown extremists receiving instructions and funding from ISIS.